Located in southern Summit County, Ohio, Coventry Township is a community surrounded by the lakes making up Portage Lakes State Park. With a population of 10,900 residents the community is governed by the three-member Board of Trustees and a Township Fiscal Officer who oversee the operation of the Fire Department, Road Department, Parks and Zoning Inspector. Police protection is provided by the Summit County Sheriff. 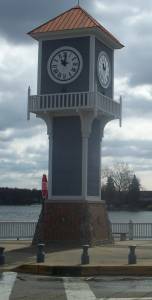 The Coventry Clock Tower was dedicated July 4, 1999, and serves as a historic landmark in the heart of the Portage Lakes. Coventry Township is on the natural watershed divide across the United States, the point at where water flows north towards Lake Erie or south towards the Ohio River. The glaciers that covered this area many, many years ago left behind a group of lakes, an abundance of plant life, and all the essentials to promote wildlife. These acts of nature are a very significant part of our local history. The native American Indians knew this area well and considered it to be a neutral territory for most tribes. Travel by canoe was the prime form of transportation. The main path of travel was from the great Lake Erie to the mighty Ohio River, accomplished by leaving Lake Erie going south, upstream, against the current on the Cuyahoga River to its southern point where the canoe had to be “portaged” or carried across land to reach another body of water to continue south. When the white settlers discovered this area they knew it was of great significance to the Indians. This natural dividing line was used in treaties to divide the Indian nations from the states. The first whites to settle within the territory that is now Coventry Township arrived in 1806. The Western Reserve had been formed and the Connecticut Land Company had classified Coventry as an equalizing township: Town 1, Range 11, the township of lakes. As settlers came, the land was farmed and mills were built to utilize the power of the water. In the 1820’s, the Ohio and Erie Canal changed the economy and lifestyle of the early settlers. The canal became a major mode of transportation thus opening up markets far and wide for the crops and products of these early settlers. The canal system needed a steady ample flow of water to fill the new channels that would generally follow the north/south route that the Indians knew so well. The original waterways would remain, but this new canal system would require more water flow. The natural lakes that existed at the summit of the great divide would be modified to supply this water, thus comprising the Portage Lakes that we know today. The canal system lost its esteem over the years as other modes of transportation developed, but the water supply was of importance in the industrial development of the area until the great flood of 1913 wiped out the system, thus ending the canal era. The Coventry area was mostly farmland and cranberries were abundant near the lakes. Coal mining was a major business in the mid 1820’s. As the general area became more populated, the lakes area became a haven for recreation. Elite families from local cities made their summer homes at the Portage Lakes. Homes were built in the lakes area and during the great depression era, many families made their lake cottages into year round homes. The township government that had started around 1806 continued to provide the organization that a growing township needed in the 1900’s. Originally Coventry Township included the Summit Lake area and the Rolling Acres Mall area, with the southern end of the Portage Path being near the center of the township, but over the years large tracts of land were annexed to the cities of Akron, and Barberton. In 1995, after seven years of negotiations by township trustees, Coventry voters passed a historic agreement with the City of Akron and became the first township in the United States to stop annexation. Today the same natural waterways that the Indians traveled are still the center of activity for the residents and visitors to Portage Lakes. The Local government, the excellent school system and the natural beauty of the area continue the rich history of Coventry Township into the 21st century.